As emerging members in the arts community in Eugene, ELAN is grateful for the opportunities for professional development provided by all our local arts organizations. With this in mind, we host the annual Community Partners Reception to both celebrate the presence, support, and success of our local organizations and introduce incoming Arts and Administration graduate students to the opportunities these organizations present, including event to attend, volunteer opportunities, practicums, and internship positions. 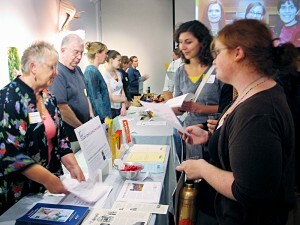 This is a great opportunity for community partners and returning students alike to meet this year’s incoming Arts Administration class, as well as speak with potential interns and practicum students for the 2012-2013 year. A representative from each attending Community Partner will be on hand with printed materials about their organization and ready to answer student questions. If your organization is not listed and you would like to table at the Community Partner Reception, please contact us.